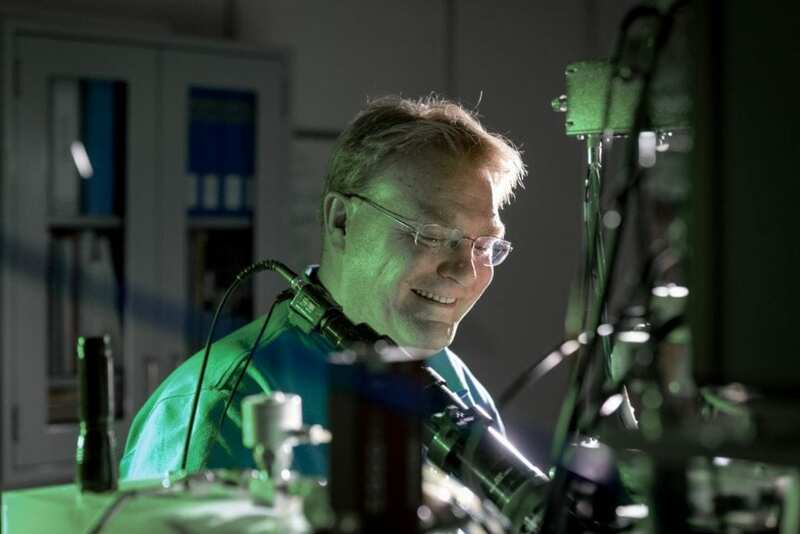 ALBUQUERQUE, N.M. — The Department of Energy has awarded Sandia and Los Alamos national laboratories $8 million for quantum research — the study of the fundamental physics of all matter — at the Center for Integrated Nanotechnologies. The award will fund two three-year projects enabling scientists at the two labs to build advanced tools for nanotechnology research and development. Because of the collaborative nature of CINT, the awards also will provide opportunities for researchers outside the labs to benefit from the new technologies. "The science community has recognized that quantum-enabled systems are the new frontier for electronic and optical devices," said Sandia senior manager and CINT co-director Sean Hearne. "At CINT, we are developing extraordinary new techniques to place single atoms where we want them and control how they interact with the environment around them so that the unique quantum phenomena at the nanoscale can be harnessed." At the atomic scale, matter follows rules of physics, called quantum mechanics, that can seem bizarre compared to a person's everyday experience, such as seemingly being in two places at once. However, budding technology is beginning to harness quantum mechanics to accomplish tasks impossible with conventional technology. Sandia and Harvard University, for example, previously collaborated to turn a single atom into an optical switch, the optical analog of a transistor, an essential component of all computer systems. CINT, a DOE-funded nanoscience research facility operated by Sandia and Los Alamos, provides researchers from around the world access to expertise and instrumentation focused on the integration and understanding of nanoscale structures. Both newly funded CINT projects will enable researchers to create and study new materials that accentuate their quantum nature at the nanoscale. Sandia physicist Michael Lilly is leading one of them to design and build the first quantum-based nuclear magnetic resonance instrument based at a U.S. shared user facility. NMR is a mainstay technology in chemistry. It's often used to learn the molecular composition of a substance, and it's also the same technology that makes MRIs work. But commercial NMR systems don't work on the very small samples that nanotechnology researchers generally produce. "If you're studying individual properties of some nanomaterial, a lot of times it won't even be on your radar to do an NMR experiment, because it's just not possible," Lilly said. Using principles of quantum information science, collaborators will build an NMR instrument sensitive enough to work with extremely small volumes. The instrument will be so sensitive that it will be able to read information from individual atoms. This single-atom resolution will be valuable to Lilly and his collaborators because it reveals more information than the conventional technique, which only looks at groups of particles together. For example, researchers will be able to study whether single nanoparticles change properties as they grow or when they get close to other nanoparticles. "NMR is a powerful technique," Lilly said. "If we can extend it to the nanoscale, I think that will benefit a lot of CINT users." Sandia will also enable nanoscience researchers to build new quantum devices by helping develop the first method to create what's called a defect center, or simply a defect, by design. In this case, "defect" means a specific location in a material where an atom has been removed and, in some cases, substituted with a different element. Previous research has discovered that certain naturally occurring defects in materials have useful properties for quantum engineering. However, "if you want to make a real device, you must be able to make these defects intentionally," said Han Htoon of Los Alamos. "You cannot rely on the defects that occur naturally." Htoon is leading the second project and is collaborating with Sandia's Ed Bielejec. They will explore how to systematically introduce single-atom defects into advanced materials in a way that lets them control the number, location and properties of the substitutions. Bielejec will lead an approach using Sandia's Ion Beam Laboratory, a facility that uses ion and electron accelerators to study and modify materials and devices. He has successfully used such machines to precisely implant defects into a range of materials. However, quantum researchers want to use new materials, including some that are only a single layer of atoms thick. This means Bielejec and his team must develop a method to fire a particle that can knock an atom out of place, and then come to a dead stop and take the original atom's place. "It's a complex task, but our incredible machines and our past success with external collaborators are what allow us to be confident that we can accomplish this," Bielejec said. "We're taking big steps forward, but we've already laid the paving stones ahead of us."